Motivation can be one of my toughest challenges. 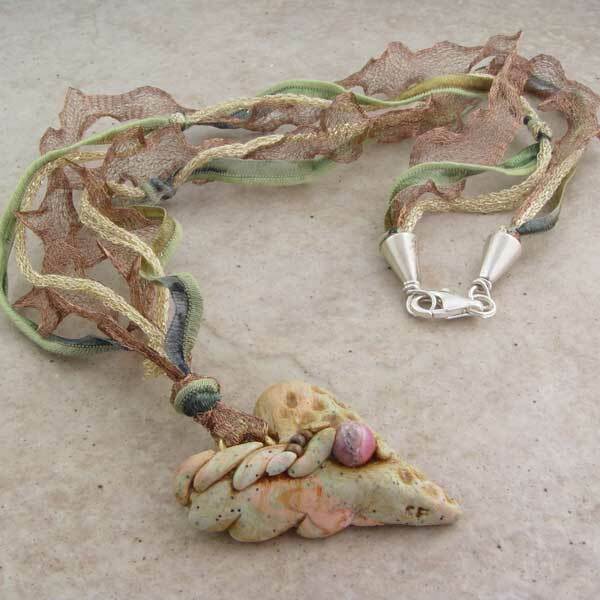 I am trying to turn my bead making, fusing, and jewelry design into a full time, income-producing job. So sometimes it is hard to make myself sit down at the torch because it feels like work. To try to get over this I promise myself little rewards sometimes. The reward can be simple like if I get 3 sets done I can have some ice cream, or if I torch every day I can buy myself a new book. There are times however, when the glass provides its own motivation. Occasionally I will discover that some sort of glass does something that I wasn’t expecting. One example is this bead. This bead used my antique silver leaf and medium transparent blue. 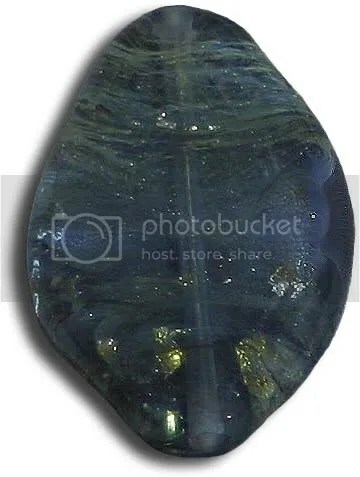 When you look at the top of the bead it looks cloudy and hazy but what you can’t see in this picture is that the haze is caused by a reaction between the blue glass, the tarnish on the leaf, and possibly the gas flame (I’m not sure if the gas had any effect or not). When I get effects like these I am often motivated to keep going to see what else I can get to happen. These special effects are my favorite kind of motivators, the free and nonfattening kind. This post was written by Heather Hertziger at her home studio. If you would like to read more of her ramblings go here. Otherwise, please feel free to visit her site here and send her an email. She would love to hear from you. Motivation is a slippery creature – sometimes hard to catch and often even harder to hang onto. I am often thankful that I do not need torely on my glasswork for a living, as I think that having to torch, rather than wanting to, would make motivation a very rare creature indeed. I am motivated to melt glass by the joy it brings me, the fascination with the flame and the way molten glass moves and by the objects of beauty that are produced at the end of the process. I’m motivated by the feel of glass beads in my hand, and by the appreciation of those who admire my beads. I am motivated by a need to master new techniques and a fascination with a craft that has existed for over 3000 years. Molten glass inspires wonder… and a sense of wonder is a powerful motivator. I have procrastinated on this topic as it frustrates me as often as it excites me. And hoped that someone else would jump in with another topic! Since no one is going to save me, I’ll lead with another look at Motivation.Designing jewelry is something I kind of fell into. It was a way to hang onto a shred of sanity during an incredibly difficult time a few years ago. It relaxed me. And then people wanted to buy what I made (which meant I could buy more beads and silver and pearls…without feeling too guilty!) and that was satisfying as well as motivating. Sometimes.But real life gets in the way more times than not and things don’t happen at a pace that you would like. I’ve always worked best under pressure…deadline-driven is how my other business has to operate and I’m much more productive when there are hard deadlines. Like many artists, though, the thrill of having someone want your work is often as motivational as the monetary result. It pushes me to step out of my box more and reach for new ideas. However, sales of jewelry aren’t exactly “needs” in the economic scheme of things, so when sales are slow, the motivation to create new things slows for me as well. It should work the opposite and I’m working to change that mindset.Something else I’m trying to jumpstart the motivation is to incorporate some “new” activities into my day and week. Instead of feeling like any free time from the book design business should be spent on the Joolz business, I’ve been looking into crocheting again. And dabbling into felting beads. I love yarns and wools (ironic since it is too darn hot for most of those materials most of the year in Arizona), and I’m looking more at the fun fibers for my play time. We’ll see where that goes. Motivation is one of those intangible things that I can’t really define as it pertains to ME. It seems to change all the time. So I’ll give you some “for-instances”. I’m motivated when I have a show coming up. I always like to have new things at each show, and it seems that the couple of weeks before a show I go into overdrive. I’m motivated when I have the house to myself. If I have no interruptions, I turn on TIVO’d programs to listen to (CSI, Cold Case Files, things like that) and go to town. I so rarely get alone time that it’s a real treat, and I use it! I’m motivated by some inner drive that keeps me going – the desire to constantly change, to constantly improve what I do, to every now and then make something that really amazes me. Motivation is such a personal thing, and it can take on many faces. Whatever it is for you, I hope that it propels you into new and exciting ventures this year! We’ve all been there. The wall. The invisible barrier. The place where we almost get to our bench, our desk, our work table and there is just something there forcing us away from what we need to do! Most of the time I give in, accept my procrastination and, somewhat relieved, go and do something else! But we all eventually have to break down this barrier and get back to work – back into the groove and reignite the passion! If it is because of something going awry or for example, a necklace just not coming together ‘right’, regardless of what I do, then I have to step back. I have to purposefully put it away so it isn’t there taunting me, and just leave it. If it is an order I will HAVE to come back to it the next day but if it is a piece for stock, then it sometimes stays put away for months! Eventually though it has to be faced, and when it is, I usually find it either comes together easily or is impossible and I need to face the reality that it isn’t going to be the way I imagined! It is important to remember that, for a lot of us, our self worth is often locked to our creations we tend to take things more personally than others – whereas in the bigger scheme of things these little dramas are just that – a little drama, easily forgotten and soon to pass. Step back, look at why you started doing what you are doing – remember the excitement, the eagerness and the passion, take a deep breath and go for it! My task for this month is to discuss the concept of motivation. So before I can write about it I had to the define the word. Webster’s dictionary defines motivation as an act or process of motivating. Which is defined as to provide with motive. And finally the main definition – motive – something that causes a person to act. which to me is one of the components of my personal motivation – my passion! My passion for touching someones life with one of the cards I’ve designed. I love and I’m grateful to be able to take in information about the recipient and make this one of a kind piece which becomes a gift as well as a card. The second component in my personal motivation is my dreams for the company. It is amazing how making cards started out as a hobby and now almost 3 years later it is a business that I love being part of and is the main source of my current life vision and goals which have in turn become my life dreams. You know in this line of business you experience various forms of setbacks such as difficult customers, bad shows, and decreased sales. For example, when we first started we took on a wedding custom order in our first year — What were we thinking? This custom order set us back financially and emotionally – we didn’t want to dare do another custom order despite the lessons learned. But I had to remember why I got into this business and realized that within my business dreams was custom orders. This gave me the motivation to say okay we will do custom orders but with restrictions and regulations. So for me my passion for touching someone’s life via a card and my dreams for ZeVin Creations to be a household name are what gives me the drive to keep going despite bad moments and/or people in this business. As Webster’s states it those two components are what cause me to act, but since I’m a math person I prefer this formula for motivation. MOTIVATION = PASSION + DREAMSMaranda Miller is one of the sisters for the company – ZeVin Creations – which provides handmade greeting cards for all cultures and occassions. 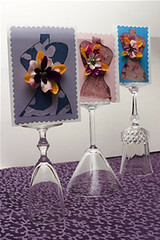 You can learn more about the company via their blog “Making Gifts Within A Card” at http://zevcards.wordpress.com. You Want To Be Me?